Fender’s been somewhat of a trend­setter when it comes to mid­range acoustic instruments. 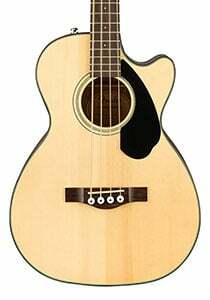 Their CB­60SCE is easily among the most capable acoustic bass guitars you can get right now. As it turns out, Fender’s base models have improved to a point where you get much more bang for the buck. There is a reason why people are turning to big name brands when choosing their first instrument. Fender CB­60SCE comes across as fairly basic, but it brings security in shape of a rock solid reputation. That becomes apparent the moment you lay your eyes on this bass guitar. What we have here is essentially a concert body shape with a cut off that features a solid spruce top. Back and sides are mahogany, which also applies to the neck. In classic Fender fashion, CB­60SCE lacks no details. You get top binding as well as fretboard binding paired with a simple black pick guard. Main finish choice comes in form of a classic lacquer. Alternatively, there is also a black version of this guitar for those who prefer solid colors. Build quality is great. Everything fits very well together, thus inspiring a lot of confidence when you pick the guitar up. In terms of hardware, you’re looking at standard Fender stuff. 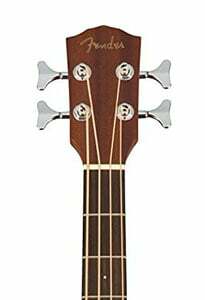 Headstock houses a set of four die cast tuning machines which aren’t necessarily the best Fender has got to offer, but they’re well within expectations. Even the most basic Fender tuners are known to be up to the task of frequent prolonged use. Bridge and saddle are simple, yet they come well set up right out of the factory. Even though we stand behind our belief that every guitar can benefit from a proper setup, Fender CB­60SCE appears to be good to go right out of the box. Since this is an acoustic electric model, there is also a preamp system on­board. Fender turned to Fishman for this build, sourcing their Classic package. Controls available include bass, volume and treble along with a built in tuner. In a way, this choice fits perfectly with the overall vibe of the guitar. Sound is where Fender CB­60SCE really comes to shine. With that said, there’s a slight difference between the two available models. The one we’re looking at today offers a slightly wider lower end thanks to its concert body. The alternate version features a Dreadnought body shape, thus bringing out more of those mids and trebles. No matter which one you go for, you’ll get the same definition, clarity and projection. That mahogany shell delivers a nice edge, which works extremely well with lower frequencies.Tone is well defined, not muddy at all and pretty warm. When its time to plug this bad boy into an amp or PA system, that Fishman package takes over. Right off the bat, it does a great job at reproducing the natural sound of the guitar with plenty of authenticity. On­board controls are basic but more than good enough to dial in a good tone. At the end of the day, Fender CB­60SCE meets and even exceeds our expectations. We anticipated a pretty basic setup that barely justifies its price. Instead, we were met with a fine tuned instrument that delivers a baseline, but also more refined performance than a good number of its competitors. For more info about the Fender CB­60SCE, click here. 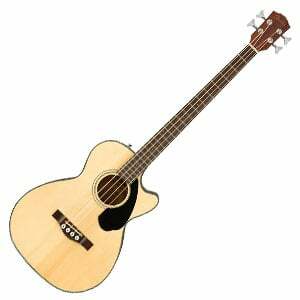 For more Acoustic Bass Guitar you might like, click here.